Effective January 1, 2012, we are changing the structure of our sponsorship fees, and I would like to explain the change and the reasons behind it. Currently sponsorships of younger children are $160.00 per year and $250.00 per year for older children. The real cost for supporting our 627 children is $258.00 per year per child. Our Board of Directors has decided that the responsible thing to do is to increase all sponsorships to $250.00 as of January 1, 2012. This new fee structure will help protect your child's education through Oaxaca Streetchildren Grassroots. As you know, the economy is difficult world-wide. Like other non-profits, making ends meet is harder than ever. In the past we have been fortunate to receive many donations to our general fund in the U.S. as well as from visitors to our center in Oaxaca. These donations have helped subsidize your sponsorships through the years. However, due to the world economy and decrease in tourism to Oaxaca these donations have nearly stopped necessitating the real cost of supporting a child to be reflected in sponsorships. As we make this change I would like to make 100% sure that we do not alienate existing donors who cannot increase their sponsorships from $160.00 at this time. In that case we will seek alternate funding to make up the difference as we do not want to interrupt your relationship with your child. It is important to remember that the education you are giving your child remains at an extraordinarily low cost. For less than 70 cents per day, sponsored children receive a nutritious meal 6 days a week, assistance with medical and dental needs, school uniforms, shoes, inscription fees and the full range of services at our center that prepares and supports them for their studies. Even in this difficult economy Oaxaca Streetchildren Grassroots is a place where your money goes a long way and provides a gift that can’t be measured in a dollar amount: an education and a chance for a bright future. 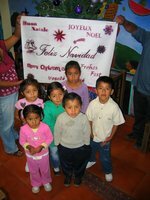 As we enter this holiday season, please accept my sincerest thanks for all you do for Oaxaca’s children! David Slaymaker, President Oaxaca Streetchildren Grassroots, Inc.
P.S. Don’t hesitate to contact me if you have any questions in regard to the changes in our fees or our program as a whole. Thanks again! From all of us at Oaxaca Streetchildren Grassroots - Happy Holidays!